Editor&apos;s Note: This is the fourth in a series of posts following the journey of Rose DeLarme and Matt Cronley, from the moment they met until that magical day lthis Saturday when they say their I-do&apos;s. The groom, Matt, wrote this particular post. To read the couple&apos;s previous posts, click here. People underestimate how much time is spent meeting different people, and all the scheduling that’s required while planning a wedding. Between florists, caterers, rehearsal dinner location, local hotels, photographers, etc., it can seem overwhelming. Thankfully, the choices became easy for us, but it would be crucial to find the perfect vendors to carry out our vision. In this month&apos;s post, we wanted to highlight two such vendors in Hendricks County that became shining examples of that for us. After meeting with a few different florists, we walked into McNamara Florist in Avon. The store is of course breathtaking, but the staff was easy to talk to, genuine listeners and were prepared to work with special requests. Having a wedding at Avon Gardens, you are surrounded by beautiful plants and flowers. Some of our requests for arrangements were a bit more exotic so that the bride’s bouquet, for example, would stand out in this kind of backdrop. Their staff was confident and excited about every idea, and made the experience fun; even for a groom. A lot of people planning a wedding feel one of the most important decisions hinges on food selection, and particularly the cake. We scheduled a visit with Marsha’s Specialty Desserts & Tierney’s Catering to discuss options. This little shop, off U.S. 36 in Avon and tucked in the side of a strip mall is easy to miss. But I&apos;m sure glad we found it. We were warmly greeted by what felt like an entire family. We explained that we were having a morning wedding and wanted a breakfast menu. Who doesn’t enjoy brunch with mimosas and bloody mary’s? We also told them sweets weren&apos;t as important to us and that we wanted to go a little outside the box. Instead of having a traditional cake, we were looking for a waffle-style cake. Some dessert shops might have balked at this request, but not Marsha&apos;s. They remained very enthusiastic about our ideas and were ready to help us. Before we left, we scheduled a tasting with them, and everyone in the shop gave us hugs as we exchanged goodbyes. We felt like we were at someone’s home rather than dealing with a business. A few weeks later we arrived for our tasting and were blown away! They had a beautiful breakfast table arranged for the two of us. We had waffles, bacon, mixed fruit, and maybe the best eggs I’ve ever tasted. They topped it all off with these breakfast kabobs! We were supposed to choose between two or three different kabob styles, but everything was so delicious that we requested them to repeat all of it, down to the exact arrangement they had set up for us that day. Their hard work stood out, and we were treated with love the entire time. We were so excited to book them to cater our wedding and be a major piece of our special day. I promise if you have any dessert or catering needs, the staff at Marsha’s Specialty Desserts & Tierney’s Catering will put their hearts into any request. So, here we are...just merely days before we say “I do,” on Saturday and everything is falling into place! We have been engaged for a year and a half now, and I’m so incredibly excited for Rose to become Mrs. Cronley. Counting the days, and thrilled to be heading back to Walt Disney World for our honeymoon! 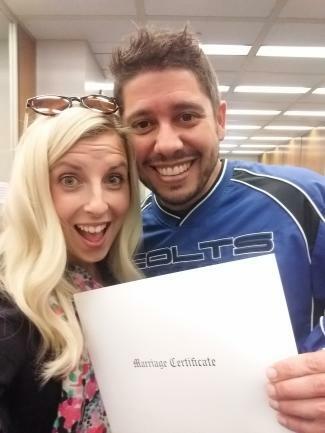 Rose DeLarme, along with her fiance Matt Cronley, were chosen as the 2017 featured couple in the Visit Hendricks County Wedding Contest. Follow them along their journey as they plan and eventually celebrate their September 2017 wedding at Avon Gardens.